Mary A. Gregory in 1924 just before she was about to cast off for Chicago. 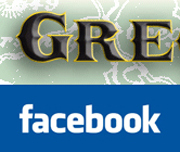 The schooner Mary A. Gregory (US No. 90776) was built by John Gregory at Edgar M. Doolittle & Orville Olcott’s yard (located at 54 Charles St in 1874), Chicago, and was launched at 4:00 pm on 18 May 1875. She was a two masted schooner of 87 tons, 84.6 feet in length, 23.8 foot beam and drew only 6.6 feet of water with centerboard up, without cargo. The boat cost $7,000 to build. Despite the common superstition among sailors that ships named after a living person would not outlive their namesake, the ship was probably named after a niece of the builder, Mary A. Gregory of Amboy, IL. She relocated to Chicago after her marriage in 1870. The vessel was built for Chicagoan Nathan Sanders, who was so proud at the launching he passed out ten cent cigars while dreaming of the profits he will be soon making. Mr. Sanders kept ownership for fifteen years and always took good care as it was reflected in the insurance ratings which never received a lower rating of A-2. She was known for her hauling of lumber cargo from Michigan ports such as Cross Village, North Manitou Island, Hamlin Lake, Beaver Island among many others. She was usually manned by only two crewman plus the captain. Her record on the lake was good, having only capsized once in 1903. At the turn of the century her ownership shifted to Michigan ports, usually owned by her master, and was well known from the Straits of Mackinac to St. Joseph. Chicago was hit with a major cold spell on the night of Friday, 8 December 1876 and the Mary A. Gregory was forced to make an unscheduled port in Chicago. Finding it impossible to make harbor, she came to an anchor outside, and weathered the night. Temperatures hit as low as 15 degrees below zero. The crew kept as warm as they could around the stove in the cabin, but they did not dare to go to sleep for fear of the vessel, capsizing, as it was nearly iced up, and was getting worst every hour. The noses and cheeks of the crew were frost-bitten, but otherwise showed no traces of the terrible experience they went through. Saturday morning she was sighted by the tug O. B. Green, which brought her to the dock near Rush street bridge, not being able to get further up the river, as the ice was too thick to break through. The Captain of the Gregory stated that he passed, Thursday evening, out on the lake, three schooners – one three-and-after, and two, fore-and-afters. He could not make out their names, but supposed them to be the schooners North Cape, Metropolitan, and Reindeer. It was reported at a late hour that one or two schooners had come into sight and the tug O. B. Green was sent out to get them, if possible. The tug McClellan was busy all day breaking up the ice in the main branch of the river, but made slow progress. The large steam propeller Messenger US No. 16654) was damaged by fouling the Mary A. Gregory on 30 June 1877. From Jacksonport, 14 Sept 1877: Captain Nate Sanders of the schooner Mary A. Gregory was buying fresh fish along this shore and shipping them packed in ice to Chicago. He was in port Monday and took 1800 pounds the days’ catch of P.G. Hibbard. 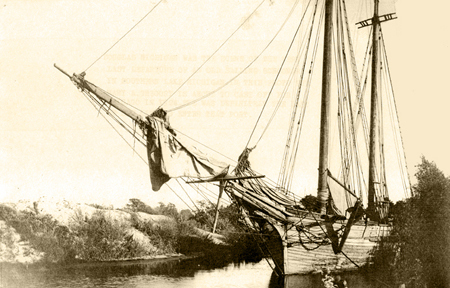 On 13 Nov 1878, she lost her jib-boon by a gale in Lake Michigan. 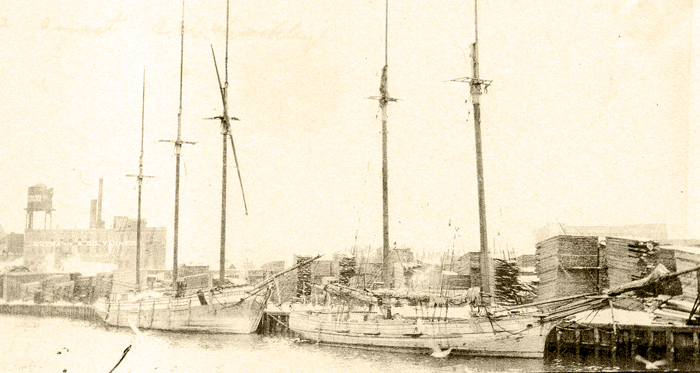 The Mary A. Gregory was reported to be in the Chicago Company’s South Side dock on 2 Oct 1880 for caulking. On 11 June 1896, the Mary A. Gregory collided with the all-steel passenger steamer Virginia (US No. 161654). A hole was punched in her, but was in no danger. 1) Bow Sprit and Prow Ornament, carved with eagle head, secured from the Mary A. Gregory built on Goose Island in 1875 – the last of the Great Lakes Schooners. This object is currently on display in the museum’s “Crossroads” exhibition. 2) Stentorn Megaphone from the Mary A. Gregory, c. 1900. This object is currently on display in the museum’s “Crossroads” exhibition. 3) Set of Seven Caulking Chisels (used to drive caulking between planks) on the Mary A. Gregory. Traditional caulking (also spelled calking) on wooden vessels uses fibers of cotton, and oakum (hemp fiber soaked in pine tar). These fibers are driven into the wedge shaped seam between planks with a caulking mallet and a broad chisel-like tool called a caulking iron. The caulking is then covered over with a putty in the case of hull seams, or in deck seams with melted pine pitch in a process referred to as paying. These objects are currently on display in the museum’s “Crossroads” exhibition. 4) Lantern with Blue Glass from the Mary A. Gregory. This object is currently in museum storage. 5) Ship’s Lantern from the Mary A. Gregory. This object is currently in museum storage. 6) Starboard Marine Lantern from the Mary A. Gregory. This object is currently in museum storage. It was 1924 when the Mary A. Gregory completed her last voyage. Starting from the foot of Union Street in Douglas, Michigan and having a small cargo of potatoes and fruit, with Captain John Woltman at the wheel along with two seamen, she headed for Chicago. This trip was the last cargo to enter Chicago under sail. After she discharged her cargo at the South Water Street Market, she was towed up the north branch of the Chicago River and moored in the mud alongside of Abe Burell’s Yacht Yard and quickly became a home for homeless sailors. It was on a spring day in 1926 that she was given a Viking-type funeral where she was towed out to the sea and burned. 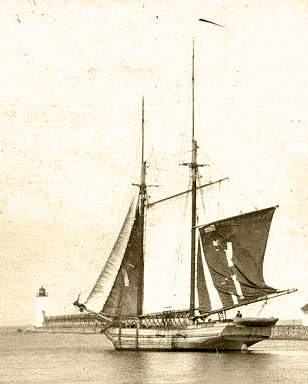 The only remaining schooners sailing on Lake Michigan left at the time was the Milwaukee bound Lucia A. Simpson (US No. 140097), The City of Grand Haven (US No. 33869) and Our Son (US No. 19437), both carrying lumber to Muskegon, were gone by 30 September 1930. It seems in 1901 the owners of the Mary A. Gregory and the G. W. Westcott (US No. 10335) swapped ships.